Yasukuni Shrine Night Sakura (靖国神社で夜桜) is one of the greatest Hanami party spot in Tokyo. There are many food stands open during Sakura is blooming. There is tables for Hanami party. 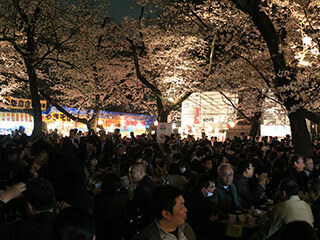 Many people enjoy Hanami Party under night Sakura. Period: Late March to early April. 1. use Metro line to Kudanshita station. Yasukuni Shrine is one of the most popular hanami(花見) spots in Tokyo. There are about 600 Sakura (桜, Cherry Blossom), and the announcement of Cherry Blossom is based on how much Sakura blooms in Yasukuni Shrne. During the end of March to beginning of April, there is Sakura festival. In Sakura festival, there is Sumo match, and many interesting events are held. Also, for Yozakura, many lanterns are placed in the Shrine.